1754~1777: born in Ôsaka; his father is the owner of a chaya in the district of the Dôtonbori; he becomes a disciple of Nagawa Kamesuke I, who gives him the name of Nagawa Shimesuke I. 11th lunar month of 1777: Nagawa Kamesuke I and Shimesuke write the kaomise drama "Daijizai Kaminari no Kodakara", which is produced at the Naka no Shibai by the zamoto Ichiyama Tajirô, celebrates the shûmei of Yamashita Kamenojô IV and welcomes back in Ôsaka Arashi Sangorô II after 3 and 7 seasons spent in Kyôto and Edo. 12th lunar month of 1781: Nagawa Kamesuke I's drama "Katakiuchi Tengajaya-mura" is staged for the first time, in Ôsaka at the Kado no Shibai [casting]. A similar play is staged a few days later under a different title, "Renga Chaya Homare no Bundai", written by Shimesuke, who becomes tatesakusha at the Naka no Shibai [casting], opening a competition between the two theaters for the best performance and the best line-up. The performance at the Kado no Shibai is a huge success and a long run. Unfortunately for Shimesuke, the performance at the Naka no Shibai is a commercial failure. 5th lunar month of 1784: premiere at the Kado no Shibai of Shimesuke's drama "Sumidagawa Gonichi no Omokage" [casting]. 2nd lunar month of 1788: premiere at the Ônishi no Shibai of the drama "Gishinden Yomikiri Kôshaku". A drama written by Shimesuke, Namiki Shôzô II, Tatsuoka Mansaku and Shimada Tsuruzô. It was supposed to be staged first in Kyôto at the beginning of the month at the Nishi no Shibai but the theater was destroyed by fire the 29th day of the 1st lunar month. The troupe goes to Ôsaka to perform at the Ônishi no Shibai and to celebrate the shûmei of Kataoka Nizaemon VII. Fall 1800: Shimesuke goes to Edo, along with Sawamura Sôjûrô III, Sawamura Gennosuke I, Fujikawa Buzaemon II and Arashi Kankurô I. 1st lunar month ~ 3rd lunar month of 1794: premiere of Tatsuoka Mansaku's drama "Keisei Haru no Tori", which is famous for its "Umagiri" scene and is produced by the zamoto Asao Okujirô I in Ôsaka at the Kado no Shibai [more details]. Chikamatsu Tokusô and Shimesuke work with Tatsuoka Mansaku on this drama. 11th lunar month of 1800: Shimesuke becomes tatesakusha at the Ichimuraza, where he writes the kaomise drama "Oishigeru Nami no Une Une", which celebrates the shûmei of Ichikawa Danjûrô VII and Arashi Kanjûrô I. Fall 1802: Shimesuke goes back to Ôsaka, along with the Edo star Segawa Rokô III. 11th lunar month of 1802: Shimesuke becomes tatesakusha at the Naka no Shibai, where he writes the kaomise drama "Azuma Giku Naniwa no Kisewata". Fall 1803: Shimesuke goes to Edo. 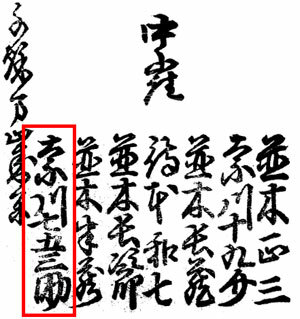 11th lunar month of 1803: Shimesuke cowrites, along with the tatesakusha Sakurada Jisuke I and the sakusha Katsu Hyôzô I, at the Kawarasakiza the kaomise drama "Yamato Nishiki Yoshino Dairi". 11th lunar month of 1804: Shimesuke cowrites, along with the tatesakusha Sakurada Jisuke I and the sakusha Fukumori Kyûsuke I and Matsushima Hanji I, at the Nakamuraza the kaomise drama "Kiku Zumô Mikurai Sadame", which celebrates the shûmei of Iwai Hanshirô V, Ichikawa Yaozô IV and Nakayama Bunshichi III, and welcomes in Edo the actors Segawa Rokô III and his adopted son Segawa Kamesaburô. 11th lunar month of 1805: Shimesuke becomes tatesakusha at the Nakamuraza, where he writes, along with the sakusha Matsushima Hanji I and Katsu Hyôzô I, the kaomise drama "Seiwa Genji Nidai no Yumitori", which welcomes in Edo the actor Ôtani Tomoemon II. 13th day of the 11th lunar month of 1806: a fire breaks out from the shop of the hair-dresser Tomokurô in the district of Nihonbashi Fukiya-chô. It spreads and burns both the Ichimuraza and the Nakamuraza, killing many spectators. It also reduces the house of Shimesuke in the district of Sumiyoshi-chô to ashes. Winter 1807: Shimesuke goes back to Kamigata. 2nd lunar month of 1807: Shimesuke becomes tatesakusha in Kyôto at the Kitagawa no Shibai, where he rewrites Chikamatsu Tokuzô's new year drama "Iroha Uta Homare no Meiboku", which is performed by Onoe Koisaburô I, Nakamura Utaemon III, Nakayama Bunshichi III, Arashi Sangorô III, Asao Kuzaemon I, Nakamura Daikichi I and Mimasu Tokujirô I. 4th lunar month of 1807: "Chikagoro Kawara no Tatehiki" is adapted for Kabuki for the first time, in Ôsaka at the Horie no Shibai (casting unknown); the script is written by Shimesuke, Tsutsui Hanji and Nagawa Sôsuke. 11th lunar month of 1807: Shimesuke becomes tatesakusha in Ôsaka at the Kado no Shibai, where he rewrites Chikamatsu Tokuzô's drama "Yaemusubi Jiraiya Monogatari". 11th lunar month of 1811: Shimesuke becomes tatesakusha in Kyôto at the Kitagawa no Shibai, where he rewrites Namiki Shôzô I's drama "Sanjikkoku Yofune no Hajimari". 9th lunar month of 1814: Shimesuke takes part in the rewriting of Chikamatsu Tokuzô's drama "Taiheiki Kikusui no Maki", which is produced in Ôsaka at the Kado no Shibai. 20th day of the 10th lunar month of 1814: Shimesuke dies in Ôsaka. "There was a stage writer called Nagawa Shimesuke, son of the keeper of a theatre tea-house, who did not create, but patched and altered at the bidding of the actors, so that he was nicknamed Sentakumono Shimesuke, or Laundry-Man Shimesuke, which gives a good idea of the playwriters' low estate at this time."